You are currently browsing the tag archive for the ‘Mikel J. Koven’ tag. 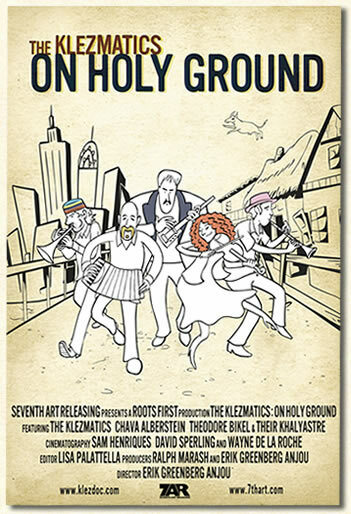 The Klezmatics: On Holy Ground (Erik Greenburg Anjou, 2010). Seventh Art Releasing. 106 min. Eatala: a Life in Klezmer (Barry Dornfeld & Debora Kodish, 2011). Philadelphia Folklore Project. 37 min. Music documentaries are difficult creatures to discuss. How does one approach them? Should the evaluation of any documentary be based on its cinematic principles, that is, as a film? Or should discussion be limited to an evaluation only of the documentary’s content? Music documentaries complicate the discourse further: is this a biography film, charting the history of a band’s development? A film documenting a particular event, like a tour or particular concert? Or is the film exploring a particular ethnomusicological idea, a filmed essay on a music topic? All of these questions are up in the air when discussing any music documentary film, and one hopes that particular films will focus on one of these potential discourses. But, alas, that almost never happens. Erik Greenburg Anjou’s The Klezmatics: On Holy Ground doesn’t seem to know what it wants to be. On Holy Ground covers tremendous ground trying to be, simultaneously, a history of the New York-based klezmer revivalist band The Klezmatics; a documentary of The Klezmatics’ 2007 tour of Poland; an exploration of the significance of Yiddishkeyt and its revival over the past twenty years; and a document of the band’s 2006 project of recording its first all-English album, Wonder Wheel, an album of unrecorded songs written by Woody Guthrie (who had a Jewish grandmother, Aliza Greenblatt). Because Anjou tries to cover so much content, each of the topics or themes he touches is never satisfactorily developed.